"Stealing the Herd," Howlround: A Journal of the Theater Commons, August 5, 2012. 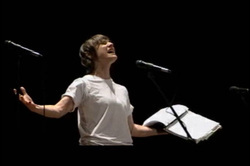 One-woman play about one of New England's most famous poets. 10-minute monologue, where Eva struggles with PTSD. Full-book musical about the "Greatest Woman Athlete of the Twentieth Century"
Adaptation of the writings of famous 19th century New England novelist. One-act play about the founder of the National Council on Alcoholism and one of the first women in AA. A play about legendary lighting designer Jean Rosenthal and her partner. One-act play that references a historical Two Spirit Chiricahua warrior. Two gender-queer fourteen-year-olds with big secrets, 1879, Portsmouth. Referencing the Smuttynose murders, attempted murder of a lesbian couple. One-woman, one-act play about 19th-century fly-fisherwoman from Maine with crush on Annie Oakley. Small-cast musical about a lesbian softball team. Audience-interactive play about a women's theatre company. Two old lesbian butches in their 80’s have escaped from a nursing home at night, stolen a sailboat, and are planning a double suicide out on the ocean.Two old lesbian butches in their 80’s have escaped from a nursing home at night, stolen a sailboat, and are planning a double suicide out on the ocean. 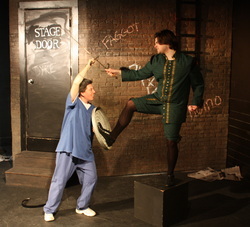 Gender-bending one-act about two productions of Romeo and Juliet. Butch tomgirl in trouble at school. Featuring an alcoholic butch mystery writer. Young butch harassed for using a women's bathroom. A one-act about a Native American lesbian couple. Young butch in conflict with her partner over "lesbian bed death." Butch PE teacher encountering racism and homophobia. Butch tomgirl heroine attempts to save her girlfriend, Sleeping Beauty. Butch housekeeper turns middle-class house upside down. Featuring butch camp counselor and butch camper. Full-chorus, full-book musical about butch athlete Babe Didrikson. Small-cast musical about lesbian musicians and recovery. Interactive courtroom drama about a women's theatre company. Comedy about a middle-class family turned upside down by the butch housekeeper. A book with an index of scenes and monologues with butch roles. A second volume of scenes and monologues, many with butch roles. Everything you need to know to put on a play with or for lesbians!